Heroes from ES Nyange lay wreath on the grave of Valens Ndemeye to honour him (file photo). 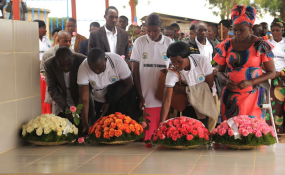 Rwandans will today mark Heroes'Day, an annual event to pay tribute to people who exemplified and defended the highest values of patriotism and sacrifice for the wellbeing of the country and its citizens. Among others, heroic values celebrated today include proven integrity, patriotism and sacrifice, acts of bravery, setting a good example, truthfulness, and love for others. Celebrations will be held in villages across the country and discussions will focus on the theme, "Sustaining heroism in a vision we have chosen". In the capital Kigali, President Paul Kagame is expected to lead other government officials and families of the country's celebrated heroes to lay wreaths at their graves at the National Heroes' Mausoleum in Remera. Deo Nkusi, CHENO's Executive Secretary. File. The Chancellor of the Chancellery for Heroes', National Orders and Decorations of Honour (CHENO), Pierre-Damien Habumuremyi, has said that the youth need to be guided into maintaining Rwanda's strong values if the country is to achieve its vision for prosperity. "We are heading towards vVsion 2050 and we cannot achieve it without heroic values and without the future generation embracing heroic values," he said last week. He was launching a weeklong nationwide campaign to promote the values of heroism ahead of Heroes' Day celebrations today. Different activities were held during the campaign, which took place from January 25 to 31, including several sports games under 'Ubutwari tournament', conferences, talk shows, as well as poem recitals. CHENO's Executive Secretary, Deo Nkusi, said that as Rwanda continues to build herself, the challenge today remains how to best instil values of heroism to the country's youth who are growing in a globalised world. In an exclusive interview with The New Times this week, the official wondered how to best teach and instil a sense of heroism in the Rwandan children while bearing in mind their way of life is shaped by a fast-paced world. "We decided that it is important to focus on the youth as heroism is no longer a thing only for the old. The youth are the ones largely working and capable of developing and defending this nation. They have the energy to work," he said in the interview. The country has progressively identified brave men and women who have loyally and exceptionally served their country in different capacities and whose deeds inspired many across generations. Rwanda's heroes being celebrated today are in three categories: Imanzi, Imena, and Ingenzi. The Imanzi category, the highest order, features people who registered utmost achievements at the expense of everything, including their own lives. They include Maj Gen Fred Rwigema, who died on the frontline the day after the launch of the country's armed liberation struggle in October 1990, and the 'Unknown Soldier', who represents all the men and women in uniform who lost their lives during the campaign to liberate the country. The Imena category comprises of people whose track record includes extraordinary acts for the country and were characterised by utmost sacrifice. This category includes King Mutara III Rudahigwa Charles Léon Pierre, Michel Rwagasana (special adviser to late King Rudahigwa), and Agathe Uwilingiyimana, the female prime minister who was slain by genocidal government forces within just hours of the start of the 1994 Genocide against the Tutsi. Others in this category include Félicité Niyitegeka, a Catholic nun who offered shelter to fleeing Tutsi during Genocide only to be killed by the Interahamwe militia alongside the people who she had hid in her house at a parish in Rubavu District; and the Nyange Secondary School students, whose school was attacked by the remnants of the genocidal forces and Interahamwe militia on March 18, 1997 (six of the students were killed on that fateful night). The Ingenzi category is comprised of living heroes but their list is yet to be published.